Paolo Nutini will play a one-off show in the UK this year at the 2,000 capacity Newport Centre in NEWPORT, South Wales on Wednesday 20th July 2016. A gig for Bevlee Jones with all proceeds going to Bevlee’s 13-year-old son - Ieuan Joel. Tickets on sale this Friday (27th May) at 9am. They will be limited to STRICTLY 2 per person & will be priced at £40 per ticket (plus booking fee). Paolo is pleased to announce his involvement in this year’s BALOISE SESSIONS. Having recently undertaken a sold-out outdoor Summer tour of the UK headlining The Eden Project, Cornwall, Leeds Millennium Square, Singleton Park in Swansea, Manchester Castlefield Bowl and Marlay Park in Dublin to over 25,000 people; Paolo Nutini will perform his biggest headline show to date in Scotland at Bellahouston Park on Saturday 29th August as part of Glasgow Summer Sessions to 35,000 excited fans. 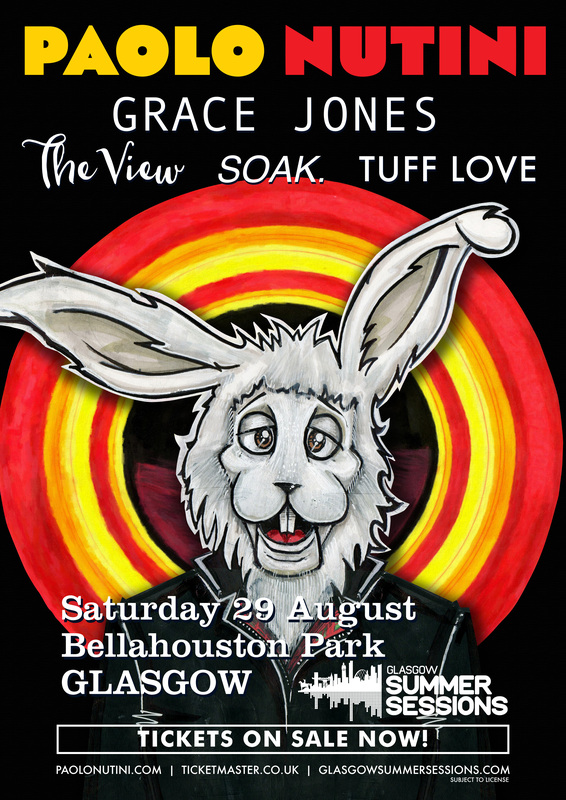 This hometown show promises to be a very special night – PAOLO NUTINI and his impressive nine-piece band THE VIPERS will be joined by the legendary, iconic GRACE JONES; Scottish rockers THE VIEW; Northern Irish singer songwriter SOAK and Glasgow band TUFF LOVE. A limited number of tickets for the 35,000 capacity event in Glasgow are still available and ON SALE NOW. Tickets are limited to 8 tickets per person / per household. 14+, under-16s must be accompanied by an adult. Paolo is heading to the Castlefield Bowl in Manchester City Centre on Thursday 2nd July and following a recent KEY 103 competition to find a local support act; Manchester five piece A Band Called Jack have been chosen to open the show. For security reasons the live concert scheduled in Piazza Unità in Trieste on Tuesday 23rd June 2015, was cancelled. The violent storm that took place in the area (of the show) prevented the show happening. Ticket holders have the right to ask for a full refund for their ticket. Refunds can be requested from 29th June 2015 until, and not later than, 18th July 2015 at the stores were they were originally purchased. If tickets were bought online we recommend you get in touch with the online retailer directly. Those retailers could be TicketOne.it, Eventim.si, Eventim.hr. Paolo Nutini's album 'Caustic Love' has been nominated for the coveted Scottish Album Of The Year Award 2014. Voting closes midnight on Wednesday 27th May 2015, so don't miss out! Paolo will be performing at Pukkelpop Festival in Belgium on Thursday 20th August. Paolo will be performing at Montreux Jazz Festival in Switzerland on Thursday 9th July. Tickets go on sale Friday 17th April 2015. Purchase here. Paolo will be performing at Lowlands Festival in the Netherlands on Friday 21st August. Paolo is pleased to announce that the Lianne La Havas will support him at Singleton Park, Swansea on 20th June and Castlefield Bowl, Manchester on 2nd July.